/Personalizing Your Items /What backgrounds, embellishments, or logos do you have available? We have a huge library of embellishments and backgrounds to choose from with advanced search options that will make finding what you’re looking for a breeze. 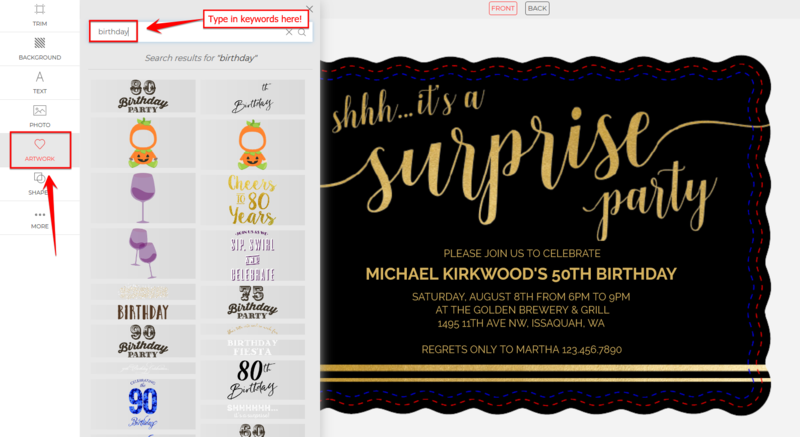 To find embellishments that fit your stationery, click on the Artwork tab on the left side of the Design Center, and try searching by keywords, category, theme, color, type, or item. For example, if I were creating a vintage themed bridal shower invitation, I could enter things like vintage, retro, or bridal shower in the search box to find embellishments for my stationery. We do not have logos available, but if you would like a monogram or embellishment created or customized for your stationery, we may be able to help. Please contact us and we will see what we can do.